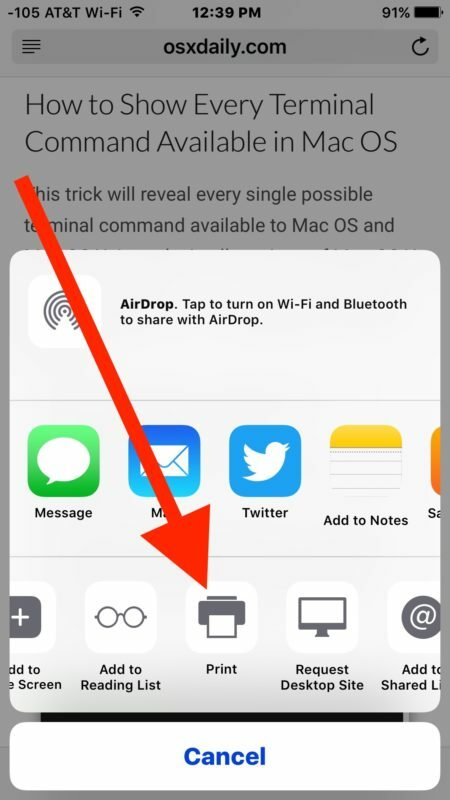 You can save nearly anything as a PDF from iPhone, all it takes is using a little known 3D Touch trick available only in Sharing action menus. Essentially this trick allows you to perform the iOS equivalent of Print to PDF like you would see on desktops like a Mac or Windows PC, except it’s on the mobile iOS world and available to iPhone users with 3D Touch devices. You can perform the Print to PDF trick in iOS from just about any app, as long as it has the Sharing button and could theoretically print from it. This includes Safari, Pages, Notes, and other apps you’d expect to have this feature in. For demonstration purposes here, we’ll walk through this with Safari where we will use the print to PDF trick on a web page. Your freshly printed PDF file will be available with whatever means you shared or saved the PDF. I typically choose to print the PDF and save it into iCloud Drive, but if you plan on sending it to another person through Messages or email to get a signature on the document or something similar, or send with AirDrop from the iPhone or iPad to a Mac, you can easily do that as well. The ability to print to PDF is very popular and widely used, so it’s a bit of a mystery as to why iOS has this feature hidden behind a secret 3D Touch gesture within the Print function, rather than available as an obvious menu item within the Print menus like Print to PDF is on a Mac. As far as I can tell, there is absolutely nothing obvious to suggest this feature exists at all and it’s basically hidden, which is a little weird given how useful it is to save things like web pages or documents as PDF files. But now that you know it exists, you can print to PDF to your hearts delight, right from your iPhone. 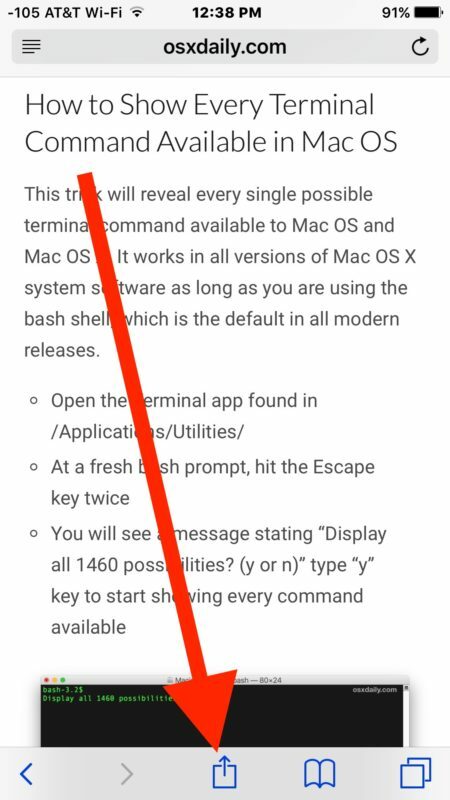 Perhaps a future version of iOS will make this great trick a bit more obvious, we’ll see. 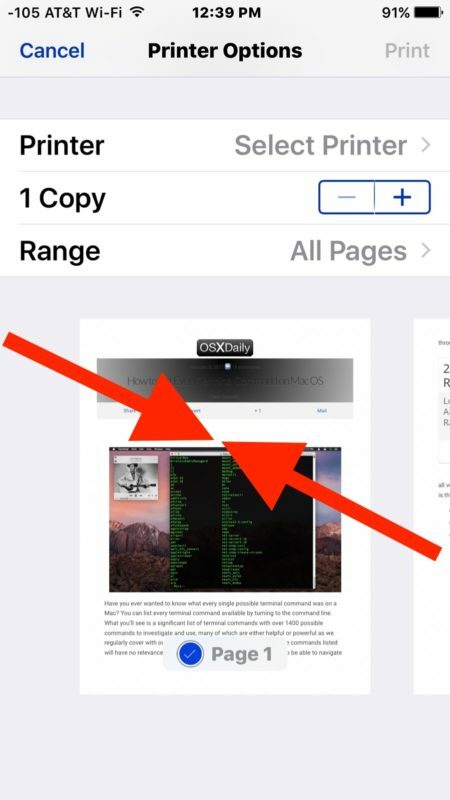 Know of any other handy PDF saving tricks in iOS? Let us know in the comments. I believe this is important for two reasons: first, because this kind of feature might be extremely useful on an ipad, where people usually edit and share documents or websites more often than on an iphone. Personally, I print to pdf more often on my ipad than on my 3D-touch capable iphone 6s. Second, because even some of those of us who own a 3D-touch capable device, myself included, tend to forget that the feature is there. More than once, I have found myself instinctively accessing print to pdf by pinching to zoom instead of 3D touching on my iphone 6s. Not to mention that I almost never remember that I also have 3D shortcuts from the home screen icons of many apps. 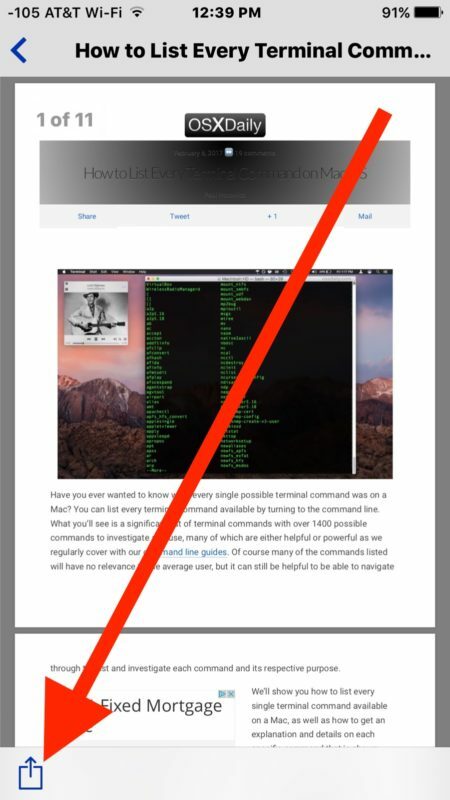 The PDF will be formatted in a better way if, between steps 1 & 2, you enable Safari Reader mode by pressing on the 3 lines at the left end of the URL. Yeah, I usually do that when possible (not every website supports the safari reading mode). Also, in step 4 the 3D touch press may be replaced by pinching to zoom in on the first page preview for devices that don’t have 3D touch. This includes all iphone models prior to the 6s, ipads and ipod touches running, as stated above, a modern version of iOS. That’s true, I do that whenever possible. Not all websites allow safari reading mode. I haven’t yet tried it from the phone, but I frequently do it from my Macbook Pro. I find I get better results (higher resolution) when exporting to PDF from within my CAD program (Vectorworks) than I get using the print function. Is there a way to set the resolution of PDF generated in Print to PDF? I believe that there is no way to set the resolution of PDF generated in Print to PDF. I am very comfortable with the default resolution. This trick did not work for me with my iPhone 6s Plus and iOS 10.2.1. 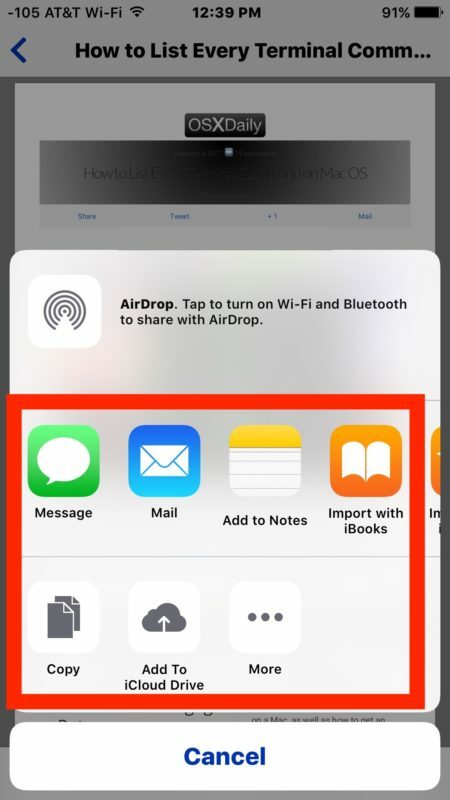 Other 3D Touch actions work, but Print in the Sharing box did not. It would be neat if it did. I use Save to Dropbox for a similar result. make sure you’re following the procedure as outlined above and that 3D touch is enabled. Alternatively, you can replicate the 3D touch press by pinching to zoom in to the preview once you are in the print dialog. Pinch to zoom also works on devices that lack the 3D touch feature, such as ipads. Try pinching to zoom in instead of 3D touch pressing. You may still be able to enjoy the feature that way. @Dave Bartram – I had the same problem on the same set up. I found that pushing a little harder made the option box appear. The first attempt at it just brought up another screen to print 1 or multiple pages. Just like Jan-Lucas stated up have to push pretty hard to get the Share icon. Then it worked! I have mine on soft pressure and it works well for me. Alternatively, you can pinch to zoom in instead of 3D touch pressing. The ‘make a pdf’ trick works on non-3D touch devices as well. Simply go through steps 1-3 above with a file x and then pinch and expand x with the fingers. This CHANGES IT INTO A PDF! Then use the share button to do what you will with the pdf version of x. Print it, export it to iBook, Mail it, etcetera. Yeah, and with a couple of advantages over the ‘save pdf to ibooks’ option from the share sheet. The first is that the ‘save pdf to ibooks’ will, as stated, send the pdf file to ibooks only whereas from the print dialog, the pdf can be sent to any compatible app on the device. The second (which may be viewed by some as a disadvantage) is that converting a website to pdf from Safari though the print dialog will not add the website URL, time, date, and page numbers at the bottom of every page of the resulting pdf document, like ‘save pdf to ibooks’ will. I have an iPhone 6 but can print PDF to open in GoodReader or send pages to Kindle. Downloading to device when you have a signal means stuff can be read offline if you’re in the sticks without wifi or signal. You can also use this feature on your iphone 6, just pinch to zoom in instead of 3D touch pressing. Excellent feature, I always use it. However, it’s worth pointing out that this feature can also be activated by pinching to zoom in on the first page preview instead of 3D touching. This is useful on devices lacking the 3D touch feature, such as iPads. Thank you for commenting, Luis! That’s exactly what I needed to be able to use the feature with my iPad. You’re welcome Vivian. That’s exactly why I commented, I most often use the feature on the ipad too. And even when I do use it on the iphone, I tend to forget it has touch ID, so I often do the pinch and zooming there as well. Wow! I did not read the original instructions and was doing the 3D Touch on the print icon instead of the first page preview. I am also excited to learn about the pinch to zoom feature which I can use on my iPad. Thanks to Luis and Jan-Lucas for your comments, and Paul Horowitz for the original article! Pages about pages about pages about 3D touching burnout an idea where 3Dtouches explained… weak. Websites, but I didn’t know about it at all – that is a great way to do it.